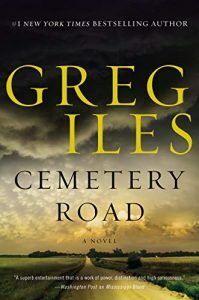 The Bottom Line: Cemetery Road will make Greg Iles a household name. At 18, Marshall McEwan left his Mississippi hometown, and his family’s newspaper business, to become an iconic journalist. His inevitable return is sparked by his father’s terminal illness. Naturally, he’s got unfinished business to take care of. He finds that his family’s 150-year-old newspaper is on the brink of disaster. To make matters worse, the love of his life has married a local powerbroker named Max Matheson, one of a dozen powerful patriarchs who rule the town through the exclusive Bienville Poker Club. To Marshall’s surprise, the Poker Club has taken a town on the brink of extinction and offered it salvation, in the form of a billion-dollar Chinese paper mill. But on the verge of the deal being consummated, two murders rock Bienville to its core, threatening far more than the city’s economic future. You won’t be surprised to learn that Marshall won’t easily let that go. Fortunately, the twisty Cemetery Road plot is full of the unexpected. Prose this cinematic, passionate and absorbing is destined for the big screen. Now is the time to get in on the ground floor of this brilliant small-town crime thriller.